There’s the taxi whose doors automatically open. When I boarded one in Kyoto, I shut the door myself, only for it to remain open as the driver, with the press of a button, slammed it shut. (This helps when your hands are full of bags and it’s raining outside.) Plus, this was charming: our driver was female and she wore formal wear with accompanying white gloves. How about those vending machines (thousands of them found in every street corner) that’s color-coded: blue labels for cold drinks and red for warm (coffee/tea) beverages. And they sell ramen, electronics, umbrellas, ties and underwear! Robots? In this land where English is not very well spoken, when we visited the Kuromon Ichiba Market in Osaka, a robot stood at the storefront, nodding left and right, waving his hands, smiling and welcoming guests. Or that see-through umbrella so that you can (literally) see-through traffic and buildings overhead as you navigate yourself in the world’s busiest crossing called Shibuya in Tokyo (where as many as 2,500 cross the street at the same time). Hungry? How about ordering via touchscreen menu? 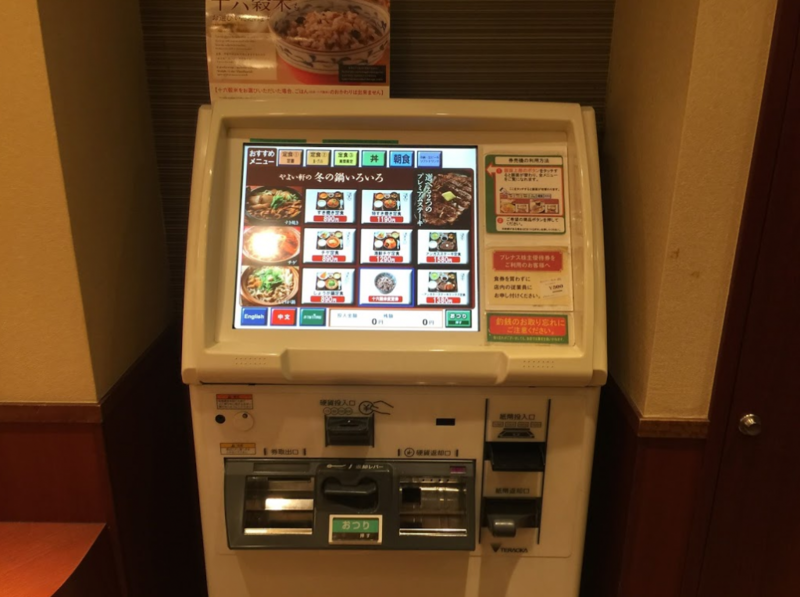 As you enter the restaurant, you choose from a variety of pictures; you pre-pay, take your seat and, 15 minutes later, your steaming hot bowl of Sukiyaki is delivered to your table (by a waiter, not a robot — that will come in 10 years). Ta-Q-Bin. This is clever. Prior to leaving Cebu, my sister-in-law Atty. Michelle Mendez Palmares and our “Japanese consultant” Jourdan Polotan introduced this idea. I dismissed it. Ta-Q-Bin is a delivery service where your luggages are shipped the next day anywhere. Why spend extra when we can carry our own luggage? I said. It turns out, Ta-Q-Bin is amazing. The day before we left Osaka for Kyoto, we shipped two large suitcases to Tokyo (our third destination). Total cost: only P800 for both items. It’s not expensive and it saved us a lot of hassle of having to drag the luggages from Osaka to Kyoto to Tokyo. We dropped off the items in a Family Mart (or they can be picked up in your hotel) and, voila, the day after, it’s inside your hotel room. Shinkansen. We took the bullet train from Kyoto to Tokyo. The distance spans 513 kms. 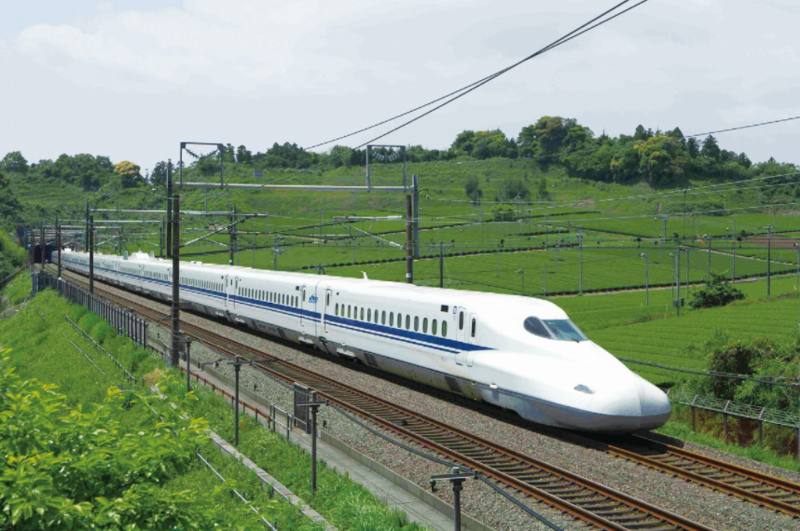 but it took the Shinkansen Nozomi train only two hours and 20 minutes, reaching a topspeed of 300 kph. It’s expensive (P7,400/person) but is a convenient hop-on, hop-off way to travel. A bonus midway through the trip: we caught a glimpse of Mt. Fuji. The coolest part? As the train leaves, the conductor at the end of the train leans out of the window and salutes everyone on the platform. But I save the best for last: the toilet bowl. Seriously. For the first time in my 22-year sportswriting career, I’m writing about the toilet bowl. To us, there’s nothing to be celebrated about this bathroom fixture; but not to the Japanese. It starts with the heated seat. Then, you hear water rumbling — it’s background noise to cover any sounds of the user. Then, after you’re done with “business,” there’s a washlet. It’s a bidet-type washing mechanism. Like all things amazing-Japanese, it spews out soothing warm water. After, there’s a dryer from underneath. Finally, when you’re done, there’s a built-in water-saving sink at the top that pours into the tank to conserve water as you wash your hands. Incredible. This, from the nation that has produced brands like Toyota, Sony, Uniqlo, Asics, Epson, Ajinomoto, Mazda, Nintendo and Yakult. Finally, lest this column get transferred to the Travel Section, a dose of sports: Tokyo 2020 promises to be the most high-tech Olympics ever. Some examples: Hydrogen-powered buses. Instant language translation. The use of facial recognition technology to verify ticket holders. Driverless taxis. Amazing. Only in Japan. KYOTO — Merry Christmas! We arrived in the “Land of the Rising Sun” over a week ago and Jasmin, Jana and I are loving every hour of our Japanese sojourn. Our first stop was in Osaka. What words would I describe the nation’s second largest city (with a populatin of over 19 million)? 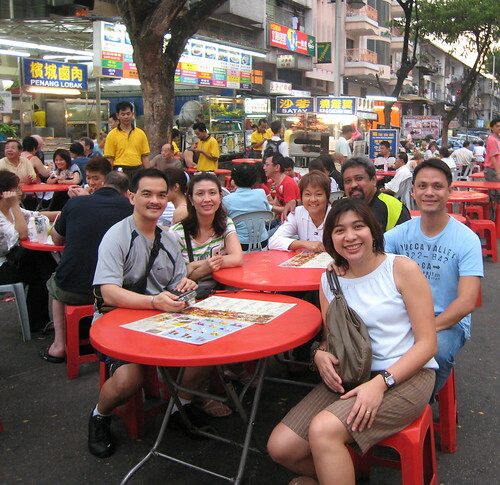 Bustling with people. Lights-filled. Progressive. Heavenly food. Japan is a country whose Christian population stands at only two percent. And so, unlike the Philippines with our myriad of activities as Dec. 25 nears, they obviously don’t practice our traditional Misa de Gallo and noche buena. But the highly-nationalistic Japanese have been infiltrated with Western culture. In particular, the playing of Christmas tunes everywhere and the displaying of Christmas lights and decors — all exhibited to excite the shoppers. So, yes, Jingle Bells songs and twinkling lights are all-present in Osaka. The best example is the Winter Illumination. The 3-kilometer stretch of the main avenue Midosuji Street dazzles with lights — making it one of the world’s longest Christmas-lighted streets. Gingko trees sparkle and historic buildings splash with color at night. As highlight, an extravagant lights show is projected at the Osaka City Hall. Osaka’s main shopping street is along Dotonbori and Shinsaibashi. Among the tens of thousands of people crowding the alley, I saw a few from Cebu: Dave Lim, one of our best amateur basketball players, tapped me in the back while we were inside the Uniqlo-operated GU store. 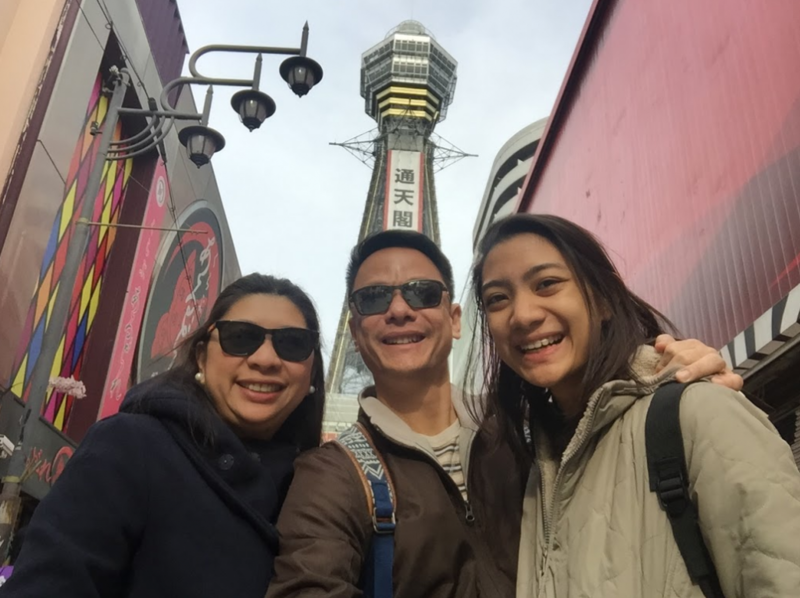 While walking near the Glico billboard, I saw a tall man — and realized he wasn’t a tourist; he was James Co (who came with his wife Jewel and their children). A many-time Osaka visitor, James quickly pulled me to recommend what he calls “the best sukiyaki restaurant I’ve tried.” The following night, we dined there and yes, the beef was steaming-delicious. A few nights before Christmas, we spotted a familiar and beautiful face: Nia Aldeguer (who came with Chris and their kids and the Durano family). Frederic and Millete Chiongbian and their triathlon champion-boys Justin and Yuan also savored the 10C cold of Osaka. From our weeklong stay here, this we can conclude about our Japanese neighbors: they are the most polite and courteous we’ve met. In their culture, it’s called omotenashi, which means “Japanese hospitality.” It’s a combination of exquisite politeness with the goal of maintaining harmony and avoiding conflict. In our first day here, we got lost. As we huddled to check on Google Maps, a lady approached to ask if we needed help. She walked us to our destination and did the tradional bow with accompanying smile. She was a university student from Tokyo. 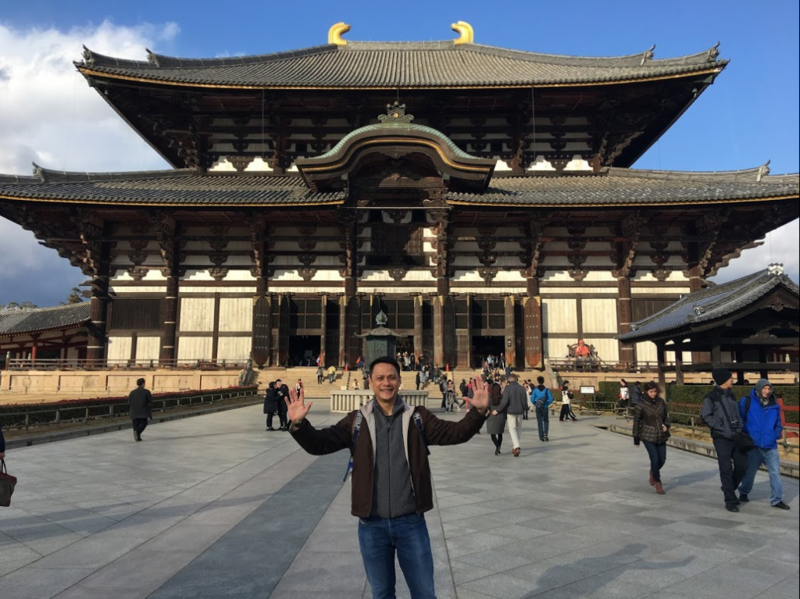 From Osaka, we took a day trip (upon the advise of Dr. Ronnie Medalle, who visited here two Decembers ago) to visit Nara. Less than an hour away, Nara was Japan’s capital from the years 710 to 794. 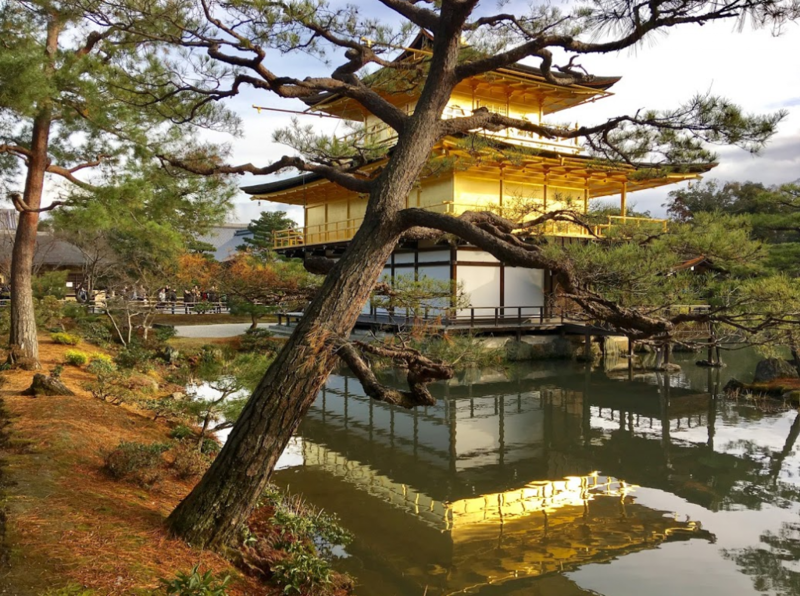 While strolling inside Nara Park, you’ll see hundreds of deer (and can feed them by hand) and your eyes will feast on the Todai-ji Temple, the world’s largest wooden building that houses the world’s largest bronze statue of Buddha. On December 24th, we moved to our next destination, beautiful Kyoto, this nation’s capital for over a thousand years. 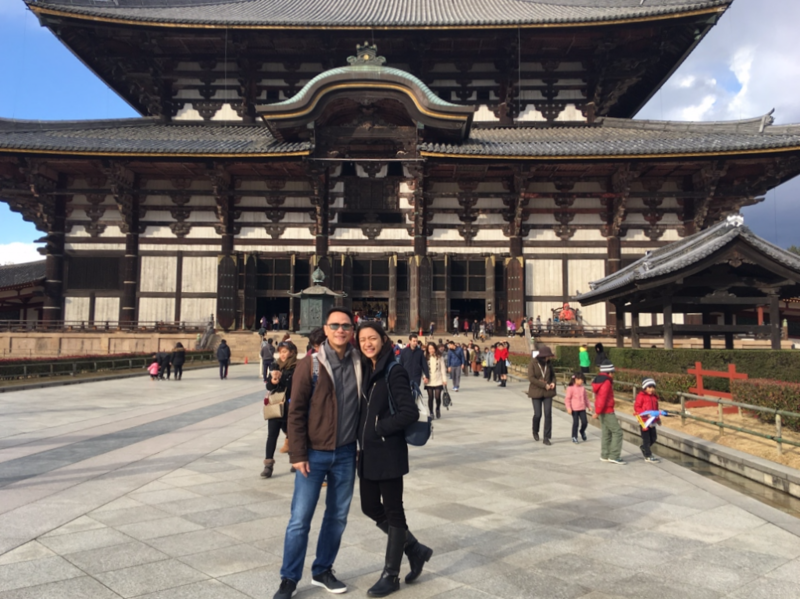 Highly-recommended by our Cebu-based Japan consultant, Jourdan Polotan, who was here last month and who’s visited with wife Jingle multiple times, we spent Christmas in Kyoto. Right across our hotel, in this city of very few Catholics, was the best sanctum to behold: the Kawaramachi Catholic Church, the cathedral of Kyoto. We heard mass at noon, singing Mary, Did You Know?, celebrating the birth of Christ in beautiful Japan. AMSTERDAM — Jasmin, Jana and I spent three days in the “biking capital of the world.” Yes, if you’ve been to the top destination of The Netherlands, you’ll notice that everyone is riding a two-wheeled, human-powered vehicle. Would you believe that six out of every 10 trips that the Amsterdammers take are not on jeepneys (just kidding, they have trams and buses) but via the bicycle. Amsterdam is not large. The population is one million and, all over the side streets and near the canals (it is home to over one hundred kilometers of canals), you see bicycles parked everywhere. Here’s the interesting part: their bicycles are ugly. Pardon the word but they pay no attention to the looks of their bikes. The more “taya” (rusty), the better. The reason is because they park their bikes anywhere and they can easily be stolen. Thus, they opt for dirty, old and rotten bikes. On running, thousands and thousands here run. I recall, back in October 2009, our closest buddies joining the Amsterdam Marathon. Doctors Albert Santos and Vic Verallo were joined by Meyrick “Jacs” Jacalan and the Ong siblings, Jane-Jane, Andrew and Nica, in finishing the Amsterdam Marathon. Perl Jacalan did the 21K. Back to our three-day trek here, the activity that we enjoyed most was the four-hour Biking Tour. We enlisted in Mike’s Bike Tours and, among the choices that included a City Tour, we enrolled in the Countryside Tour. Starting at 11 a.m. here last Friday, we joined 30 others. After a briefing by our tour guide Vincent, we chose our individual bikes and started pedaling. Riding single-file, it’s a terrific way to explore Amsterdam. Every roadway here has a bike lane. Located between the road (for cars) and the sidewalk (for pedestrians), the clearly-marked bike pathway is that safe area for bikers. We toured the city streets before heading towards the famous Amstel River. It’s a scenic ride. The temperature was a cool 17C degrees and we pedaled inhaling fresh air and gazing at countryside homes. The windmill was one of our major stops. The Riekermolen Windmill, built in 1636, was huge. After posing for some photos and visiting the statue of Rembrandt, we headed off and visited the Rembrandthoeve farm. We listened to Dutch farmers explain how to make Gouda cheese and they demonstrated how to make the traditional art of making wooden shoes. Next, it was back to the bike and a lot more pedaling through, as their official website reads, “the polder landscape with it’s rectilinear ditches and dikes.” By 3 p.m., we were back to the garage to park the bikes. We should bike more. Just ask the Dutch. Shifting topic to non-tennis, you’ve got to visit Gardens By The Bay when you come to Singapore. This country has always been known for their flora. From the moment you step out of Changi Airport, millions of trees and flowers and grass fields await you. This tiny nation (2nd smallest in Asia) has a land area of only 714 sq. km. — much smaller compared to our Cebu island’s 4,943 sq. km. Yet, in every corner and walkway, greenery mesmerizes your eyes. 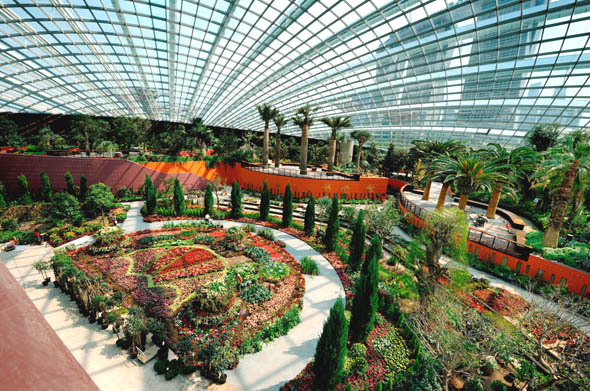 Gardens By the Bay, which opened in 2012, spans 101 hectares of reclaimed land. 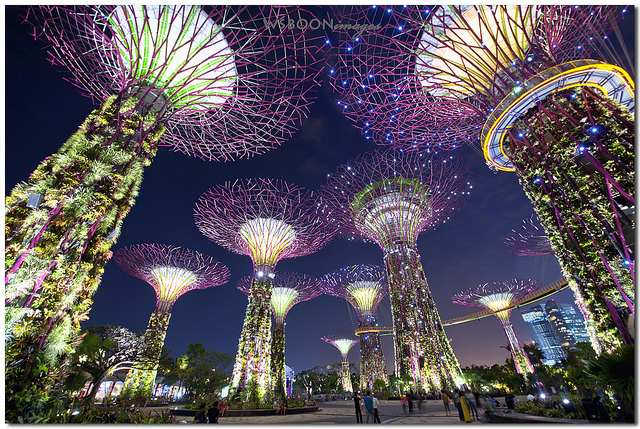 The SuperTrees tower above all; they’re giant, man-made structures that illuminate at night and are shrouded with various species of plants. The crowd-drawers are the Cloud Forest and Flower Dome — these are fully-encased glasshouses that are home to waterfalls, vines, palms, flowers and so much greenery from all over the world. Words cannot describe the natural beauty that’s exhibited in their latest attraction. No wonder Lonely Planet, in their latest guidebook, picks Singapore as the world’s No. 1 country to visit. SEOUL, KOREA–This city is huge. Next only to Tokyo, it owns the title of “the world’s second largest metropolitan area” with 24.5 million people. 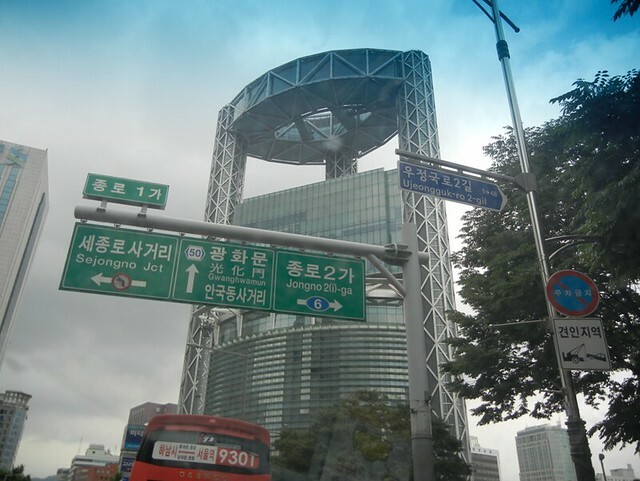 About half of the entire population of South Korea reside in the Seoul National Capital Area — an expanded version of the City of Seoul, much like Metro Cebu or Metro Manila. 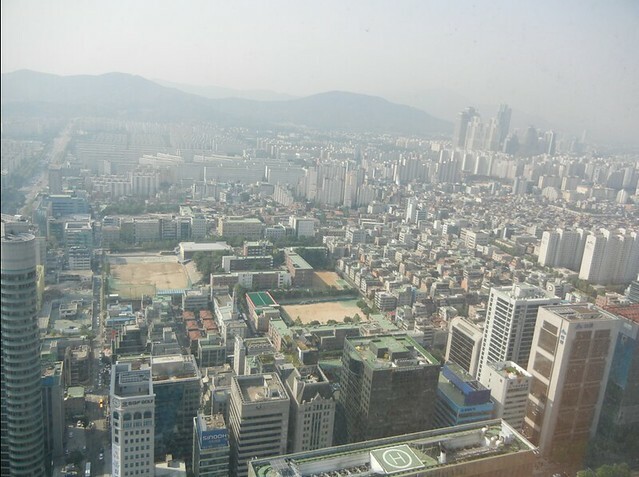 Seoul is expansive and vast. In the three nights that we stayed here, we traveled to several places. In almost each stop, traveling time takes 30 to 45 minutes — and the roads are eight-lanes-wide. Traffic exists, but not much. Vehicles move. Everybody here moves. Fast. We went to the DMZ. That’s the De-Militarized Zone, about 40 minutes from hotel in Downtown Seoul. 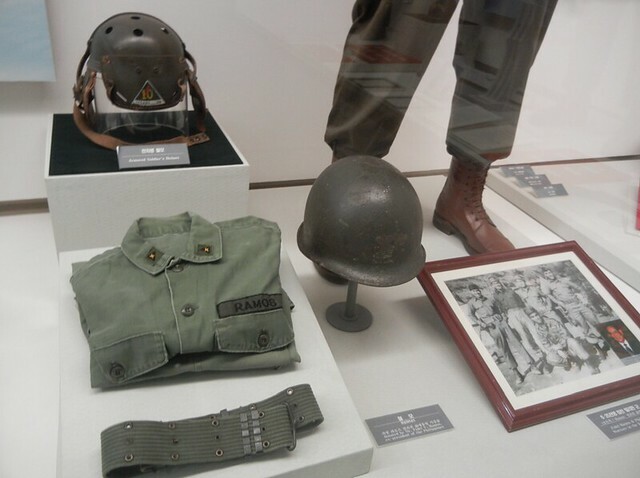 At the DMZ, we watched a video of the war between the two Korean sides in 1950 that claimed about four million lives. We traversed the 3rd Tunnel, walking down over 300 meters below sea level. The location was called the Joint Security Area. 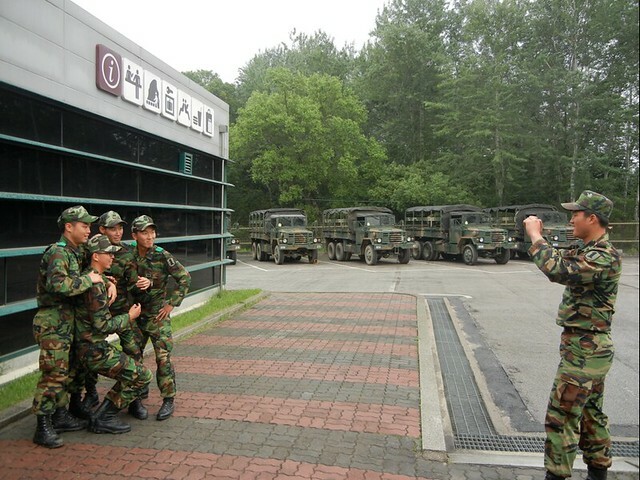 As is expected, the “38th Parallel” is the most militarized border in the world. 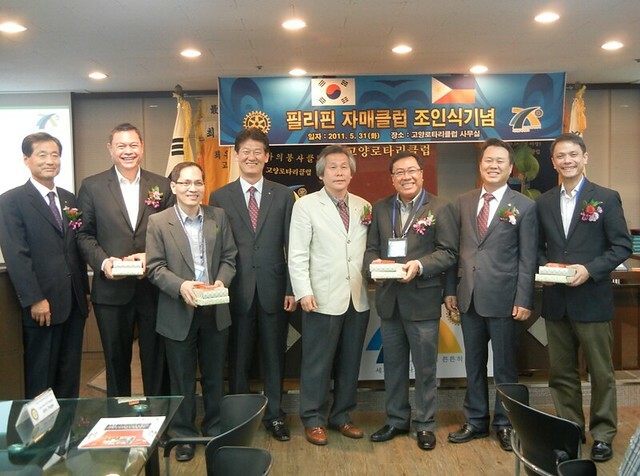 The day prior to DMZ, we had a whole day of business gatherings with the PHL Ambassador to South Korea, Luis Cruz. Dr. Bernard Villegas spoke. So did the officials of KEPCO, one of the world’s biggest energy firms — and one who has three power plants in our soil, including two in Cebu (Naga). Food? Since I love spicy dishes, I’m at home here. Kimchi, “shabu-shabu,” and many more that perspire you while you sit and dine… these abound here. 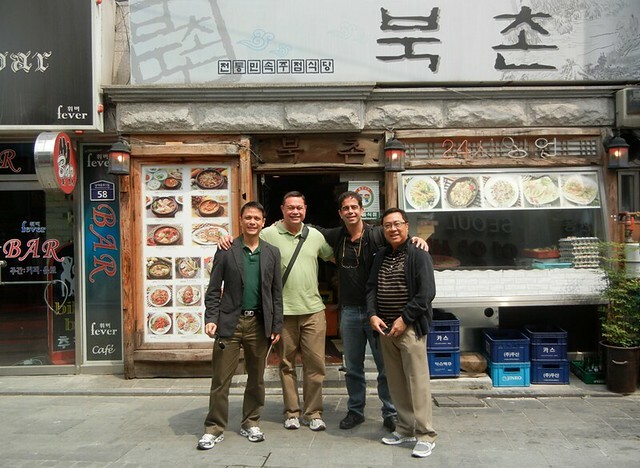 After the DMZ experience, our four-person Cebu group got hungry. It was 2 P.M. Scouring through the inner roads, we found a small, home-like restaurant. 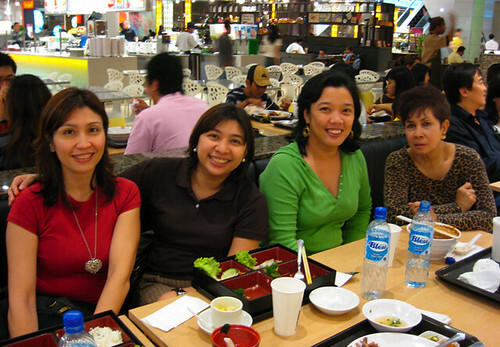 It was our best meal here; seafood soup, mackerel fish (much like our “buwad”), beef Bulgogi with noodles — it was perfect. Rotary? Since Joe Soberano (the president of the Rotary Club of Cebu) and I (the president of the Rotary Club of Cebu West) were together, we had Rotary work to perform. 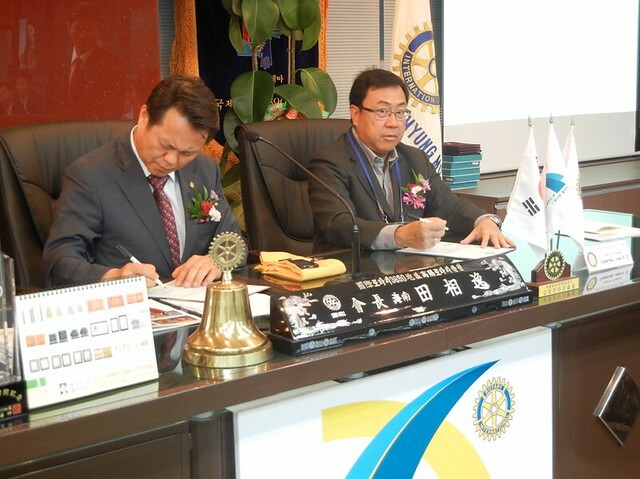 The Rotary Club of Goyang, an organization of over 100 members, has an existing sister-club relationship with RC Cebu. Joe, Boni Belen (an RC Cebu past president), my dad and I joined their meeting two nights ago. It was formal. Everybody wore a suit. 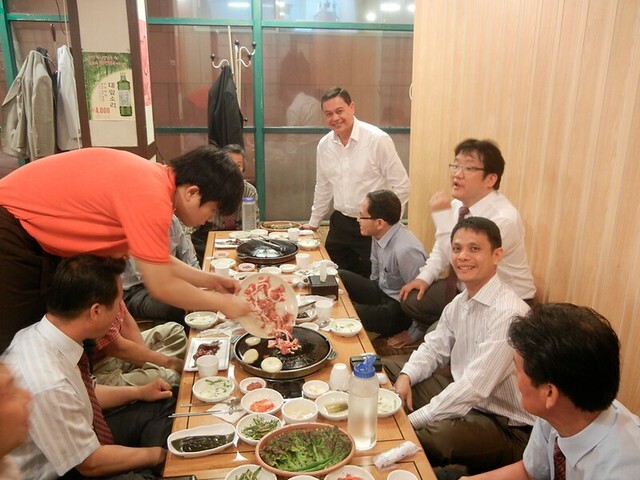 From 7 to 8 P.M. inside RC Goyang’s own office space, Joe sat at the presidential table and gave a speech. 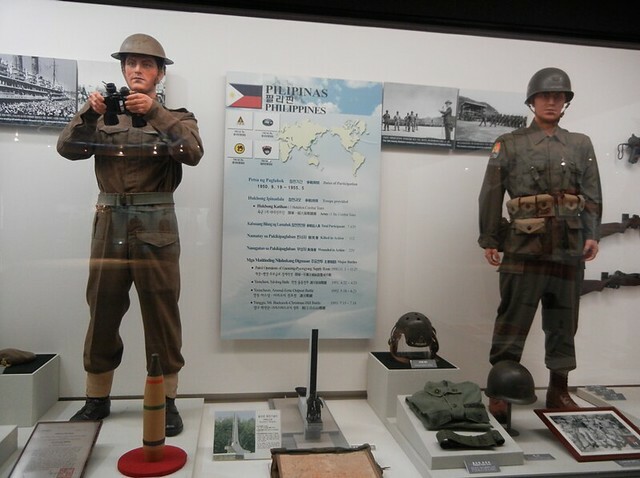 The Philippine anthem was played. We proudly placed our right hands on our hearts. 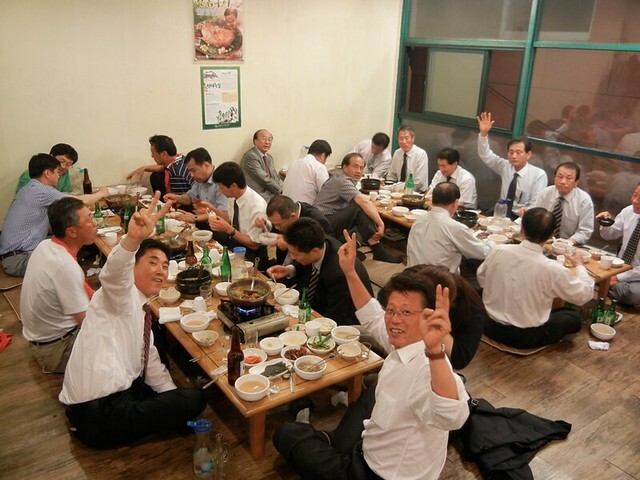 After the serious Rotary ceremonies, it was off to dinner at a Korean establishment. 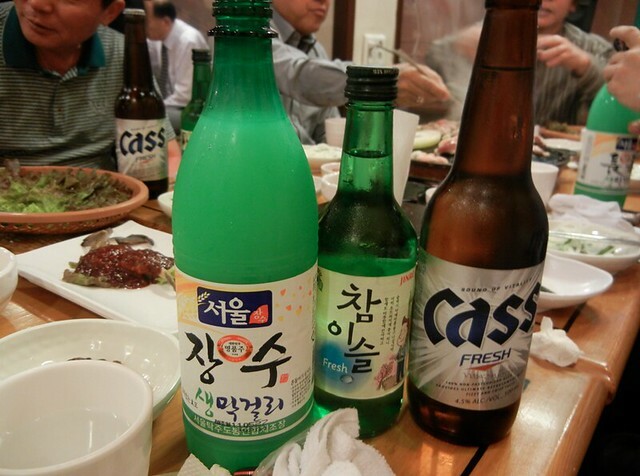 We had three types of alcohol (soju, their famous wine; another type that I couldn’t decipher; and Cass beer). We had crabs, duck, some form of octopus, plenty of kimchi, and an overdose of spicy dishes. From the seriousness of no-smiles of the Rotary meeting, the dinner was boisterous. The Koreans, no doubt — as reflected by their work ethic and status as a First World Nation — know both: they work hard and are serious, but they also relax, drink and revel in the opposite, fun-side of life. Sports? Sadly, I can’t report much. I did see the Olympic Stadium, built when this nation hosted the 1988 Games. We also passed the FIFA World Cup Stadium. Too bad I did not get a chance to step inside both. Baseball is No.1 here. 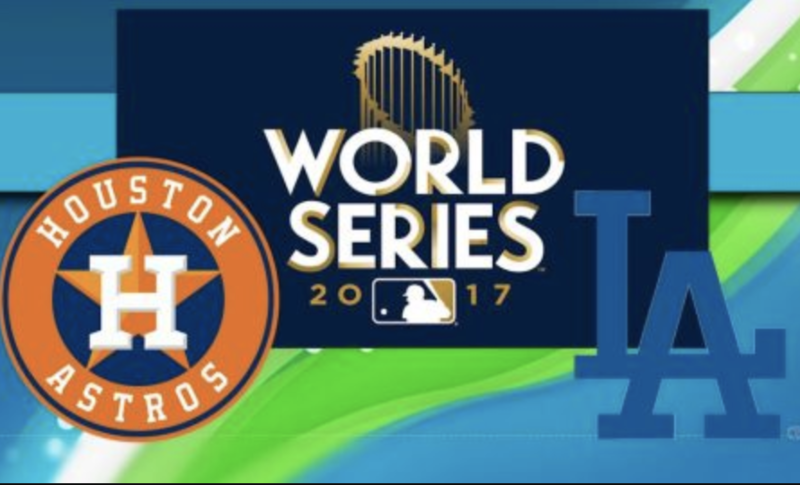 While I previously mentioned that Football was tops, I believe the game of mitts, backstops, bunts and sacrifice flies, is the top game here. In all, the “Soul of Asia” is terrific. If only their cable TV showed the French Open, it would be near-perfect. HONG KONG—The one place I visit the most here is not Nathan Road in Tsim Sha Tsui or the Harbour City-Ocean Centre mall or Victoria Peak up the mountains. It’s not a ride aboard the iconic Star Ferry or a stroll along Granville Road. It’s not even inside shops like H & M or Esprit or Uniqlo or Giordano. The one site I frequent almost daily? Victoria Park. I love Victoria Park! 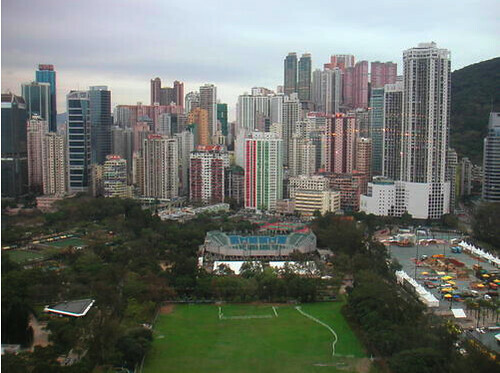 Almost each early morning here, I jog about half a kilometer from my hotel in Wan Chai and visit the ground that’s filled with hundreds of Hong Kongers.